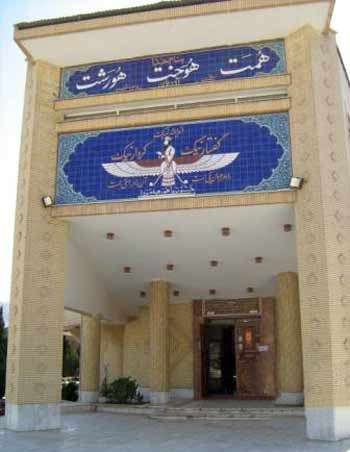 The only anthropology museum of Zoroastrians in the world, which showcases the ancient history of Zoroastrians, is in Kerman’s Fire Temple. The idea of launching the museum along with the library of Kerman’s Zoroastrian Society came to light in 1983, when the head of the society, Parviz Vakhashouri, and the former head of library collected cultural heritage artifacts of Kerman’s Zoroastrian community. These two officials added many other objects to this collection. The museum was officially inaugurated during Jashn-e Tirgan in 2005 by Iran’s Cultural Heritage, Handicrafts and Tourism Organization (ICHHTO). Jashn-e Tirgan or Tiregan is an ancient Iranian rain festival observed on July 1. The festivity refers to archangel Tir (literally meaning arrow) or Tishtar (lightning) who appear in the sky to generate thunder and lightning for providing the much needed rain. 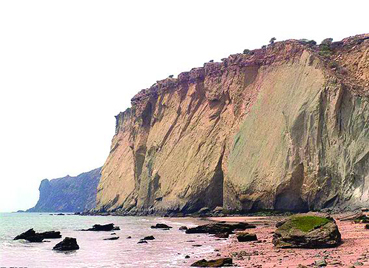 According to a legend, Arash-e Kamangir was chosen to settle a land dispute between the two countries of Iran and Turan, which in the ancient Iranian language refers to Central Asia, literally meaning “the land of the Tur“. Arash shot his arrow on the 13th day of the Persian month Tir to designate the border between the two countries. The people of Turan, who had suffered from lack of rain, and Iran celebrated the settlement of the border dispute, as peace and rain poured onto the two countries. 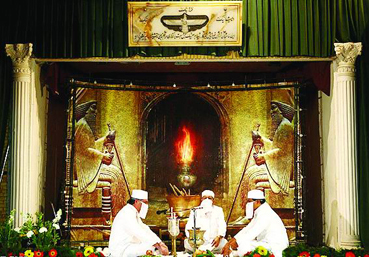 The occasion is today celebrated by Iranian Zoroastrians. In the festivity marking the occasion, people dance, sing, recite poetry and serve delicacies such as spinach soup and sholeh zard (a traditional Iranian dessert made with rice, sugar, oil, saffron, rosewater as well as crushed pistachio, almond and cinnamon). Children rejoice by swimming in streams and tying rainbow-colored bands on their wrists, which are worn for 10 days and then thrown into a stream. The building of the museum was designed in the 1990s in the wake of the endeavors of Behdinan Farzaneh, Hormuzdiyar Ashidari and Mahindokht Siyavashiyan and it was completed in 2001. Among the oldest items of the museum is a book hand-written in Gothic (an archaic Germanic language) script, dating back to over 200 years ago and a brazier on which the date 1207 in the solar calendar (1828 in the Gregorian calendar) is engraved. Among the precious sections of the museum is the section for fartur (picture) and documents. The pictures of the Zoroastrian Society of Kerman and Rafsanjan and personalities like Arbab Khosro Shahrokh, Mirza Borzou Amighi, Keshvar Khanom and Pourandokht are particularly valuable. A section of the museum is designated for different types of braziers and lanterns. Another section showcases women’s clothing items dating back to 50 to 150 years. These items include coats, dresses, headscarves and pants decorated with floral patterns. Every year during Norouz (Iranian New Year) holidays, Kermani youths guide those who visit the fire temple and museum. Throughout the year, these youths attend the museum’s training classes in order to harmonize the descriptions of items displayed in the museum and fire temple about Zoroastrian rituals. Due to the efforts of these youth, in the new Iranian year (started March 21), for the first time, the area for the visiting non-Zoroastrians was separated from the area used by Zoroastrians for worship so that they can say their prayers in a more serene atmosphere. The idea of launching the museum along with the library of Kerman’s Zoroastrian Society came to light in 1983, when the head of the society, Parviz Vakhashouri, and the former head of library collected cultural heritage artifacts of Kerman+s Zoroastrian community. These two officials added many other objects to this collection. The museum was officially inaugurated during Jashn-e Tirgan in 2005 by Iran’s Cultural Heritage, Handicrafts and Tourism Organization (ICHHTO), Iran Daily reported.